Scroll down to watch the stomach-churning video, if you dare. A 51-year-old man from China had been suffering nosebleeds for over a week when he finally made his way to the hospital. A shocked doctor quickly figured out what was causing his suffering: a blood-sucking leech was lodged inside the poor man's nose. 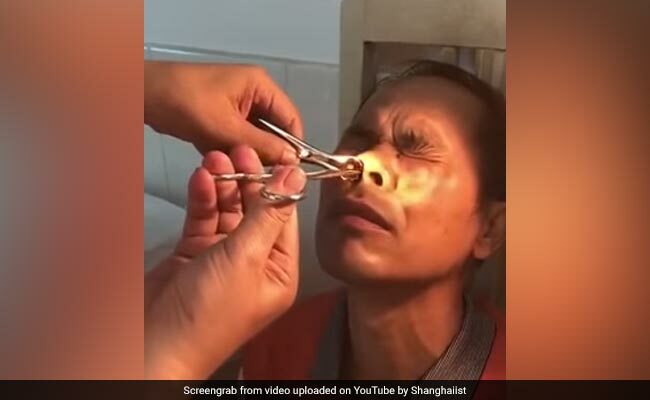 A seriously gross video going viral on social media in China shows the doctor pull out the leech - still very much alive and wriggling - from the man's nose. According to Malaysia's The New Straits Times, the doctor was able to spot the giant leech lodged in the man's right nasal cavity by simply looking up his nose. In the video, the doctor begins by using a pair of forceps to open up the man's right nostril wide. He then inserts a pair of tweezers and slowly begins to extract the leech. All the while, the patient's eyes are squeezed shut (we don't blame him). The physician eventually pulls out the bloodsucking parasite and shows it to the man - who, we must say, looks surprisingly calm. The doctor even shows off the leech, which is writhing around, to the camera. The video has been watched over 1.2 million times on Facebook and shared over 18,000 times since it was posted by Shanghaiist on Friday. Most people reacted to the video in absolute horror, with some wondering how the leech ended up in the man's nose in the first place. According to Shanghaiist, the man believes the leech may have crawled into his nasal cavity after entering through his mouth. He thinks the leech may have been in the mountain spring water he drank while he was working in China's rural Yunnan province the week before. Shanghaiist estimates the parasite was likely only as big as a hair then. While it's unclear why the man did not feel such a large leech inside his nose, Mark Siddall, a researcher at the American Museum of Natural History, told Live Science that since leeches are soft and very changeable in shape, they can easily fit inside the nasal cavity. Mr Siddall said he knew of several cases in which people were not initially aware of a leech in their nasal cavity and only found out because of "a sliding sensation in their nose or persistent bleeding, or the leech peeking its head out." The condition in which a leech (Hirudinea) attaches itself to a person's skin, or the inside of the mouth or nose is called hirudiniasis. Last year, a cockroach crawled up a Chennai woman's nose. The invasive creature was extracted from the 42-year-old woman's skull intact -- still alive and kicking. Last month, a US woman's horrific experience about finding a cockroach in her ear went viral. It took nine days for the critter to be extracted from her ear canal.